Published: January 23, 2019 16:48 Pratyush Sarup, Special to tabloid! From repurposing architectural waste to materials that respond to the touch and those that bring in a spot of nature into the built envelope, the material palette for the coming years will move on from mere ornamentation or function, to affect us at a more intimate level. Using offcuts from marble workshops, London-based designer Robin Grasby has created a material that can be used for worktops, wall coverings, tables or as tiles. Altrock is produced by using residuals such as marble flour, chunks and chips of stone set in resin. The recycled raw material constitutes 87 per cent of the product density, the designer allows the marble chunks to find their own place in the resin binder. As a result no two slabs are ever the same, and this man-made material ultimately becomes a reflection of the randomness found in nature. Cast by hand, the material can be pigmented as per the client’s request, making fit endless creative schemes. Whist solar panels become increasing more accessible — in terms of cost, as well as installation and functional friendliness — photovoltaic surfaces promise a seamless integration of design and the Sun’s power. LafargeHolcim in collaboration with electronics manufacturer Heliatek are developing a HeliaFilm cladding system that weighs less than five per cent of a traditional solar panel and can be integrated into concrete, steel and glass. Heliasol, Heliatek’s stick-on, stand-alone solar film works pretty much like car window films and can be applied to existing buildings. Dutch designer Marjan van Aubel has developed a self-powering hydroponic greenhouse composed of solar glass panels. 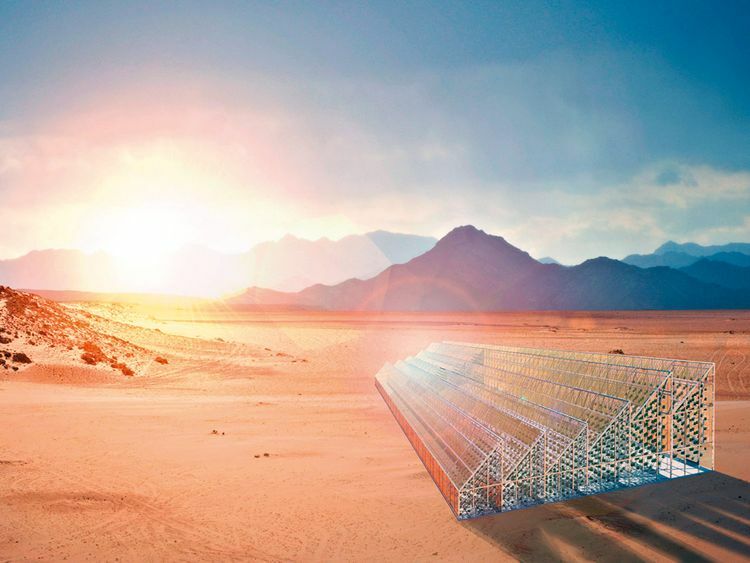 Ideal for locations without easy access to electricity, these new-gen greenhouses could be installed on rooftops or even the desert. From the Sun, to sand, there is abundance of these natural resources in the Middle East and collectives such as the Dubai-based, multidisciplinary design firm Tinkah are steadfast in their research to find contemporary applications of silica compound. The team’s fascination with sand is not new: they represented the UAE at the London Design Biennale 2018 with a presentation featuring contemporary hourglasses arranged on a mechanised rig that implored us to question the relativity of time. 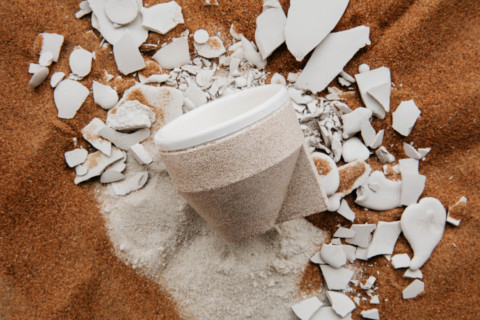 Their latest product, the Ramal collection of cups uses a slip-cast method. Designed to tame the characteristics of desert sand into a mouldable medium, this method can have a wide range of interior applications as well. Material designer Enis Akiev has created an evocative material from plastic waste by subjecting it to processes akin to rock formation. Working with her thought that ‘nothing is worthless’, the Germany based designer has created ‘Plastic Stone’. This composite has the same rigidity of tiles, the beauty of mosaics, and does its due for the environment by removing plastics from the beach and oceans. Joining her on her quest for bacteria-led, New-Age materials is London-based Bastian Beyer who is exploring the potential of biologically reinforced textiles as construction materials. In his project, sprays of sporosarcina pasteurii bacteria added a calcite layer a tensile knitted structure, ultimately delivering a rigid column. In due course, this technique could create building materials that are biologically responsible to its environment. Led by designer Hannah Croft, the experimental materials studio Muuna is known for conceptually driven textiles. Using familiar design elements such as weaving, embroidery and traditional embellishments in juxtaposition to innovation that often seeks to fuse diverse production realms and incongruent materials such as resin, Muuna is known for treading in the world of fantasy with their uber-innovative concepts. One of the latest experiments was centred on ‘growing’ a crystal farm on handwoven fabrics.